No-Rise Pizza Dough - only 5 ingredients! Just mix together and it is ready to bake. Great weeknight recipe. SO much better than takeout!!! Flour, baking powder, salt, milk and butter. We make this at least once a week! Great recipe! We LOVE homemade pizza, but sometimes it is a last minute decision to make pizza at home. 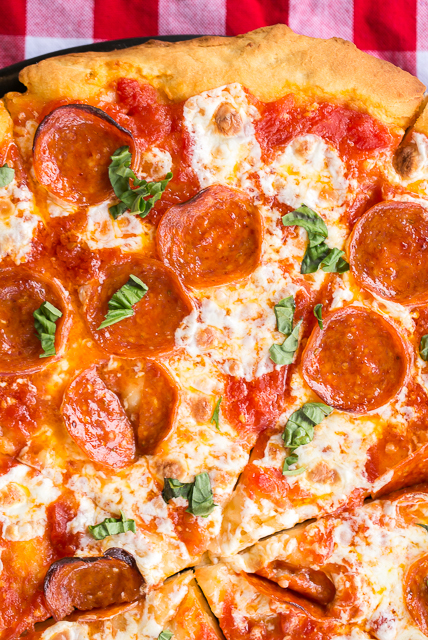 This No-Rise Pizza Dough is the perfect weeknight pizza dough! Just mix it up and it is ready to bake! SO easy! The best part is that this dough tastes great too!! We've made this several times in the past few weeks, and I am already planning on making it again this week. I topped the dough with the No-Bake Pizza Sauce that I shared yesterday - SO DELICIOUS!!!! I am getting hungry just looking at the picture of the pizza. I might have to make this again tonight. This is obviously a new favorite! We bake our pizza on a pizza steel. It makes THE BEST pizza. I bought it at Amazon. You can get it here - http://amzn.to/2jfUnPn. It is totally worth the price if you make pizza at home. We preheat the oven for about an hour to get the steel nice and hot. If you don't have an hour, just preheat the oven with the steel inside. It will be fine. I roll out the dough on a piece of parchment paper and bake the dough on the parchment paper on the steel. I use a cookie sheet to transfer the pizza to the steel in the oven. It works great! The pizza tastes better than any restaurant! Place pizza steel or pizza stone in cold oven. Preheat oven to 475ºF. Place flour, baking powder, salt, milk and butter in the bowl of an electric mixer fitted with the dough hook. Mix on low until a dough forms. Place dough in a glass bowl and coat with olive oil. Cover and let sit in a warm place for 10 minutes. Remove dough from bowl and roll out into a circle on parchment paper. Roll out to desired thickness. Top dough with sauce, cheese and toppings. Using a large cookie sheet, transfer pizza to oven. Bake for 10 to 12 minutes, until crust is golden brown. Remove from oven and enjoy! 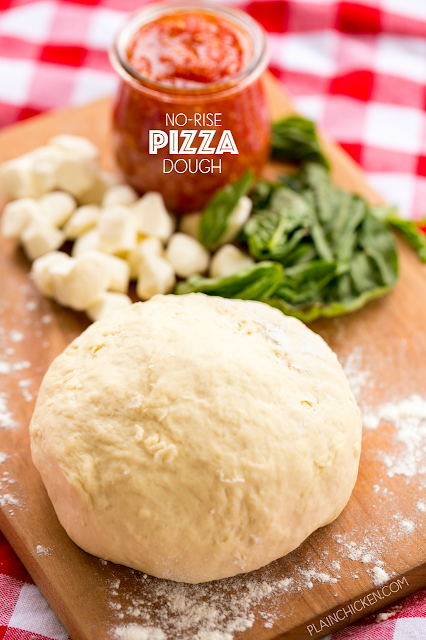 Our go to no rise pizza dough recipe has greek yogurt as an ingredient, so I'm very anxious to try your recipe! Those large containers of yogurt can get pricey. The No Cook Pizza sauce was so easy and delicious! Thanks for sharing! If I have to heat the pizza steel for an hour, then why not just make a yeast dough? Karen, you don't have to do anything. Make the pizza the way you prefer. This is how we prefer it. Van this be refrigerated or frozen to use later? Sounds and looks amazing! I love pizza and this will be the first time I have made one at home. Thank you for sharing the recipe.